Sure, there are a dozen “Prestige TV” shows premiering this month, including “Fargo,” “The Leftovers,” “American Gods,” “The Son,” “Veep,” and more. But sometimes you just want to turn your brain off and enjoy television in one of its purest forms—as escapism. Remember when TV was fun? For the most part, the creators of “Prison Break” do and they’re here to tap your adrenalin more than intellect with this long-delayed fifth season for the Fox hit. One of the most B-TV guilty pleasures of the ‘00s hasn’t been “rebooted” as much as simply picked up seven years later. We’re in this strange era of nostalgia with new chapters for “Gilmore Girls,” “24,” “Twin Peaks,” and now this, years after we thought these shows had run out of stories to tell. Someone else can write the piece about how people want to live in happier days than they’re in in 2017, but is “Prison Break” worth the resurrection? Somewhat surprisingly, given the quality of at least the second half of the four seasons of the original series, the premiere is pretty fun. This is an hour of familiar faces, pulsing music, fast cuts, ridiculous twists, and bad dialogue. At its best, “Prison Break” is kind of the “Fast & Furious” of episodic television—not taking itself too seriously and providing equal amounts of crazy plot twists, action sequences and cheesy dialogue. Only on “Prison Break” could a character say “This piece of gum is going to start a sequence of events that will finish on the other side of the world,” and fans nod along with agreement. Sure, why not? “Prison Break” embraces its ridiculousness, allowing you to check out mentally after a long work day. If that doesn’t sound appealing to you, if you want to break down a show more intellectually, there are plenty of other options. After a quick recap (that pretty much ignores seasons two through four), “Prison Break” wastes no time getting into the action. Michael Scofield (Wentworth Miller), thought dead at the end of the series, actually faked his death. T-Bag (Robert Knepper), of all people, gets a photo of Scofield handed to him on his last day of residency at Fox River Penitentiary. He shows the photo to Michael’s brother Lincoln Burrows (Dominic Purcell), who goes to Michael’s widow Sara (Sarah Wayne Callies), since remarried and taking care of her son. Is Michael really alive? Why would he fake his death? And why does the photo make it looks like he’s in another prison? Heading to the other side of the world, “Prison Break” even finds a way to bring Sucre (Amaury Nolasco), C-Note (Rockmund Dunbar) and Agent Kellerman (Paul Adelstein) back into the narrative. The boys are back in town, and ready to break out again. 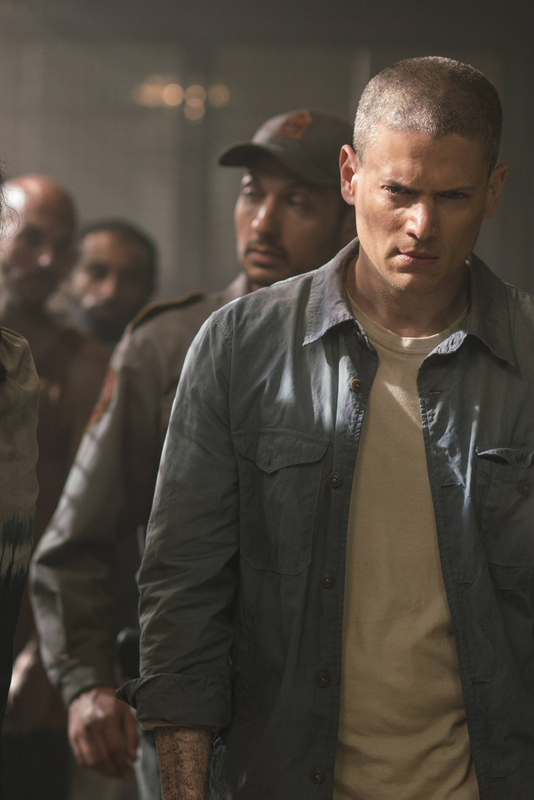 The season premiere of “Prison Break” is wonderfully ridiculous, involving remotely controlled cars, digging up a coffin, and a prosthetic hand. It’s knowingly, winkingly cheesy, saying to viewers, Can you believe we’re doing this again? Sadly, when the show settles into the new break plotline in Yemen in subsequent episodes, it’s notably less interesting. “Prison Break” is not exactly the best place to go for any sort of serious analysis of anti-radicalization or the rise of ISIL. And the new break doesn’t live up to the glorious insanity of the first one. It’s actually kind of boring, and the last thing anyone wants from “Prison Break” is boredom. However, when the show does embrace its true nature as B-TV escapism—when T-Bag has a robot hand and Lincoln is escaping terrorists—it works better than most of the recent revivals (I’m looking at you, “24: Legacy”). There’s enough real drama in the world in 2017. Sometimes you just want to watch people who are having a much worse day than you are overcome their own problems. Welcome back, Michael Scofield. The world needs you.